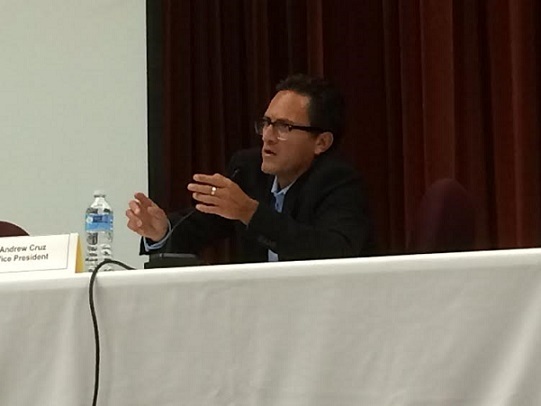 At Thursday’s Chino Valley Unified School District board meeting, the first since his political monologue at the July 16 session that created a furor, board member Andrew Cruz asked for time to speak prior to the 19 public comments. I shot video (watch the first part here) and transcribed his comments verbatim, mistakes, missing words and all, as best I could. Cruz: “Since our last board meeting, I thought a lot of my comments made in an unorganized, hasty manner. Although I support strong family values, I have never intended to exclude any single child from my heart, because I believe every living human being is very precious and is born with unfortunate purposes in life. If my comments made, derived from research and news media reports, may have left you victimized, please accept my sincere apologies. ‘Cause that’s not who I am. Look for my column on the meeting in Sunday’s paper. This entry was posted in Around Chino by David Allen. Bookmark the permalink. Thank you for transcribing the comments of Mr. Cruz. People are listening carefully to his remarks. He might be wise to write down and read his statements so his views are clear. Even the part he wrote down wasn’t very clear, was it? Well, after a rather slanted report on the meeting in a rival paper to the south there’s lots of interest in your Sunday column.